There’s a hum to the night of major cities. It’s the sound of unceasing traffic, neon lights buzzing, televisions on in every apartment, and more, and it creates a unique energy that you don’t find outside of places like New York City, Atlanta, Chicago, etc. It’s the kind of anxious energy that comes with a lack of sleep—paranoid and twitchy. 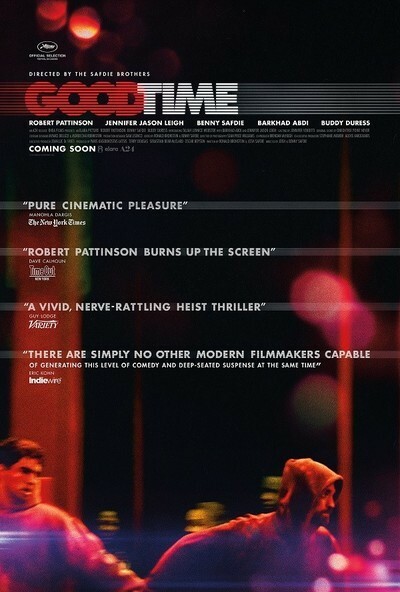 That hum pervades the Safdie brothers’ excellent “Good Time,” a film that reminds me of great “city movies” of the ‘70s like “Mean Streets” and “Dog Day Afternoon.” With a central performance from Robert Pattinson that feels like a direct descendant of Al Pacino’s in that Lumet film, “Good Time” is a movie that can’t sit still, and I mean that in the best possible way. There’s a palpable sense of anxiety and panic that comes through in every heated frame after the film’s inciting incident. It’s one of those rare movies that makes you feel edgy, conveying its protagonist’s dilemma in ways that prey on your nerves and emotions more than just relaying a night-from-hell anecdote. “Good Time” opens with one of its only relatively sedate scenes (although even it is filmed in such a way that it feels tense). Nick Nikas (the film’s co-director Ben Safdie) sits uncomfortably in a court-ordered therapy session. Through the exchange with his doctor (Peter Verby), we learn that Nick was violent with his grandmother, and that he’s mentally handicapped enough to not fully understand how to control his anger or the social repercussions of his actions. Just as the therapist is getting somewhere, Nick’s brother Connie (Pattinson) bursts in and takes Nick out of the room. Connie thinks he’s doing good by protecting his brother—of course, he is not. And this will be a theme of the night ahead of Connie, one in which he’ll constantly try to fix a situation but only make it worse. The movie proper opens with a bank robbery. Nick and Connie want $65,000 from a bank and appear to get away with it before a dye pack covers them, and their payload, in bright red dye. Nick gets nabbed by the cops, sending him to Rikers Island. Too much of the robbery money is ruined to make his bail, so Connie needs to come up with $10k as quickly as possible to get him out. He starts with his girlfriend (Jennifer Jason Leigh), and, well, things get crazier from there in ways that I wouldn’t dare spoil. Working again with the great cinematographer Sean Price Williams (who shot the Safdies’ “Heaven Knows What,” Alex Ross Perry’s “Queen of Earth,” and others), the Safdies give “Good Time” a claustrophobic energy that’s hard to fully convey in a review. It’s accomplished through intense close-ups and a style that could be called jittery but never calls too much attention to itself. It’s a visual language designed to enhance the enhance the mood of its leading man without distracting from it, and it works remarkably with an assist by a pulsing score from Daniel Lopatin. By and large, films are passive experiences. We sit in the dark and allow stories to play out in front of us, behind the safety of the movie screen. Movies like “Good Time” that break down that comfort and make us as edgy as their protagonists are rare and should be embraced. They give us the characters that stand the test of time and, as with “Dog Day Afternoon,” people keep discussing four decades after their release. Connie Nikas is one of those characters.